Cold Fusion Guy: Atheism - Is that all there is? Comment: Meaning is found in Christ! Why do Theists insist on bringing up things like The Meaning of Life in arguments against Atheism when The Meaning of Life is in fact a complete mystery that smarter people than you have failed to answer? "Love is another one. Why do they ask "How do Atheists explain love?" rather than "how do Atheists explain hungry?" 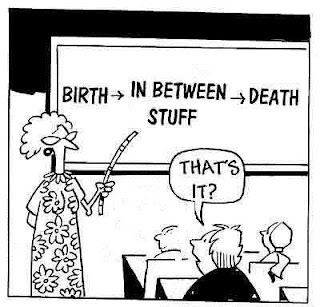 With or without religion, "What is the meaning if life" is such a mystery that actually the QUESTION makes no sense. "Meaning" as in what? "Meaning" to who? And by the way, why is Jehovah your answer to where "meaning" comes from? Why not Athena? Why not The Monkey King? Why not Superman? Come to think of it, you're using a complete and utter mystery to God of the Gaps an explanation for something that might not be there at all! That's double God of the Gaps.